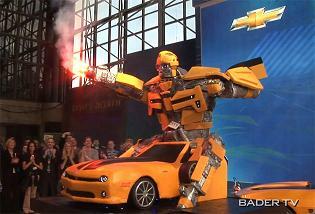 After we saw Bumblebee suits which transforms from Camaro to Bumblebee, meet Chef Buddy Valastro, the star of TLC series “Cake Boss” was recently approached to make a cake that looks like Bumblebee to celebrate both the Camaro and Transformers: Dark Side of the Moon. Valastro and his team collaborated with special effects’ guys to make a special hydraulic system for the cake so that Bumblebee could be able to move his wings up and down and yes, his eyes glow and there are some fireworks involved as well. The cake itself is made from vanilla and buttercream frosting. Valastro said that the cake was the biggest challenge of his career in more ways than one. The sculpture had to be crafted outside of the chef’s bakery due to its height.